After reading the recent PhotographyBLOG announcement of the 100+ megapixel CCD developed for astrometry, I wondered just how long it would be before a 100 megapixel CCD was available in a consumer ultra-compact. So, I decided to plot the maximum number of megapixels in a 1/1.8” CCD for each year since 2000, and then extrapolate what year that maximum would reach 100 megapixels. 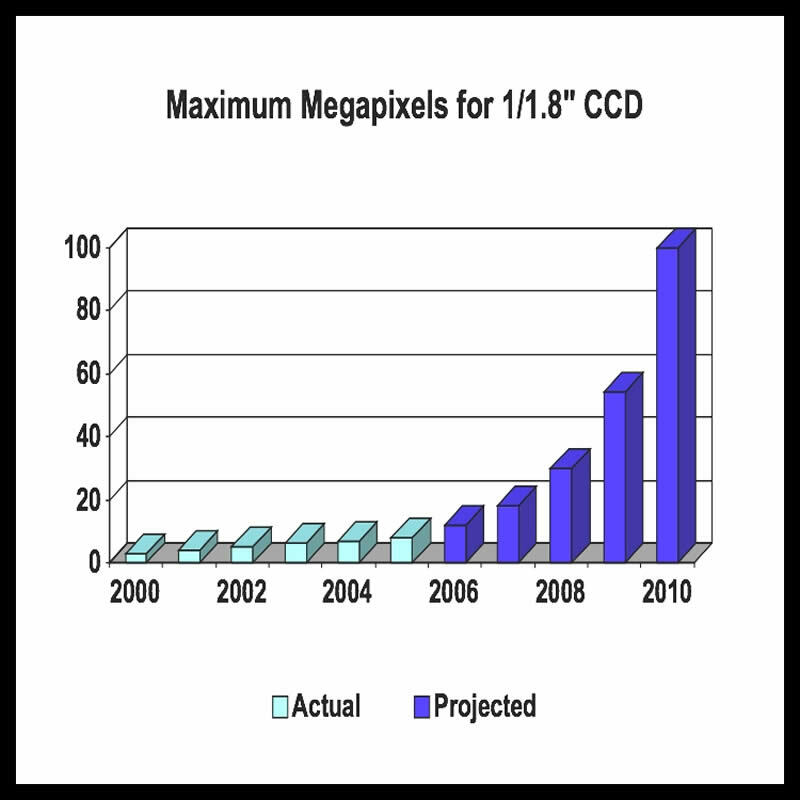 What I found was that, by the year 2010, 100 megapixel CCD ultra-compacts will have become a reality (see the accompanying chart). But then I asked myself, so what’s the point? Even if lenses with that kind of resolution could be made inexpensively enough for consumer cameras, the file sizes would be enormous, and for what purpose? Such resolution would be wasted on anything smaller than poster size prints. The largest paper my Epson Stylus Photo 2200 printer can handle is 13“ x 19”, and 10 megapixels resolution is plenty for that size. 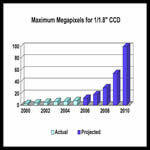 For non-professional printing, I absolutely cannot see any need for CCDs with greater than 10 megapixels resolution. Do you agree Gary? Frank, that’s an interesting prediction. I look forward to seeing 100+ megapixel CCDs in consumer ultra-compacts by the year 2010, but not for the reasons you might think. My inclination would be to provide a simple means for implementing that highly elusive, 10x optical zoom, ultra-compact. Here’s how it would work. As you suggested, for print sizes up to 13” x 19”, there really is not much point in having more than 10 megapixels resolution. So that would mean, if you had an ultra-compact with a standard 3x optical zoom lens and a 111 megapixel CCD, setting the camera’s image size to 10 megapixels would enable an additional 3.3x digital zoom, with no loss of image quality. That would yield 10x ‘total’ zoom at a reduced 10 megapixels with the same image quality as a 10x ‘optical’ zoom lens and 10 megapixel CCD. The above calculations were made using a square aspect ratio for the 111 megapixel CCD. This makes perfect sense, since the multitude of pixels would allow you to use the camera’s internal cropping to achieve any desired aspect ratio and orientation, while still maintaining your camera’s horizontal orientation. I am generally not a believer in ‘signs’ from above, but this one was just too powerful to ignore. As you know, I’ve been trying to decide which 10x zoom ultra-compact to give my wife for our anniversary, the Panasonic Lumix DMC-TZ1 or Kodak EasyShare V610. It has been a tough choice, mainly because the TZ1 is not very compact and the V610 is not image stabilized. But lately, I’ve been leaning heavily towards the V610 … that is until watching television last night with my wife. It was during a commercial for the TZ1 that my wife exclaimed, “Oh, I like that!” She was obviously referring to the TZ1’s OIS, which was being demonstrated in a moving car by a pretty model who was pointing the TZ1 out the car window and snapping a picture. 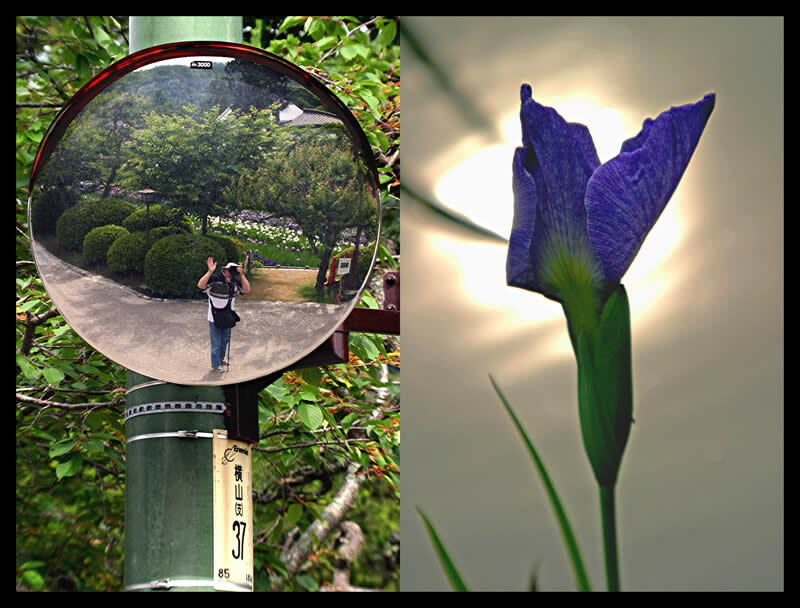 My wife thought OIS would be a great feature to have in a camera, not realizing, of course, I was about to give her a camera without that feature. Needless to say, I did a complete about face in my thinking. Well, not exactly. Thanks to the PhotographyBLOG announcement of Jeff Keller’s review of the Canon PowerShot SD700 IS at DCResource, I discovered, and not a moment too soon, that (1) the SD700 is highly rated for quality, performance, and ease of use, (2) it uses the USB 2.0 ‘High’ Speed transfer mode, as compared to the 40x slower ‘Full’ Speed mode used by both the TZ1 and V610, and (3) it has a 4x image stabilized zoom lens combined with an ultra-compact and VERY stylish body.